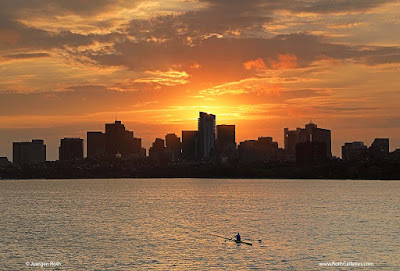 Memorial Drive in Cambridge, MA provides a top notch photo location for Boston Skyline Photography. Usually parking near or around the Massachusetts Avenue bridge yields in some great photo opportunities. I really enjoy coming here at any time of the day but this spot yields great photography potential at late afternoon into the night and in the wee hours at dawn into the early morning. In the morning plenty of rowers working out hard on the Charles River in preparation for the Head of The Charles or for their own health and fitness. I love watching them and always feel like it would be a ton of fun to try it it myself! In this latest crew photography image I patiently waited until the rower went into gear and took off upstream. I anticipated where the rower would be starting out and the potential route the rower would take. This allowed be to settle on a pleasing composition ahead of time. With manual focus in play I pre-focused on the anticipated area where I wanted the rower in the picture and ones the rower was close I started releasing the shutter. I really like how the image tells a tail of the early morning solitude and experience that the rower must have felt that morning. The composition is enhanced by the single scull adding additional interest to the foreground and the tail in the water behind the boat leading towards Beacon Hill and the newly constructed Millennium Tower in the background. During post-processing I removed dust spots and imperfections, adjusted lighting, contrast and color saturation before sharpening the final image of Working Out Hard.